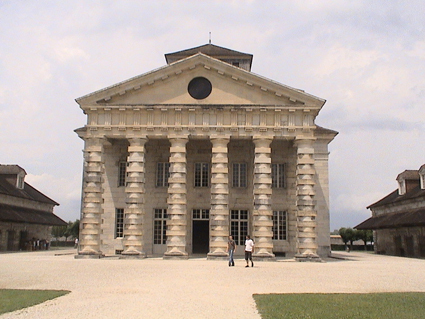 The Salina Real d'arc et Senans, constitutes an exceptional architectonic work, conceived by the visionary architect Claude-Nicolas Ledoux, in the XVIIIth century. The Concert of inauguration of the Destellos Foundation, has been realized in the exceptional site of the Saline d'Arc et Senans in France. The program consisted in works of argentine composers : J.Halac, S.Diez Fischer, E.Justel, H.Vaggione, B.Ferreyra, D.Schachter, A.Viñao, G.Castillo, E.Kusnir, R.Minsburg, and B. DelBoca. 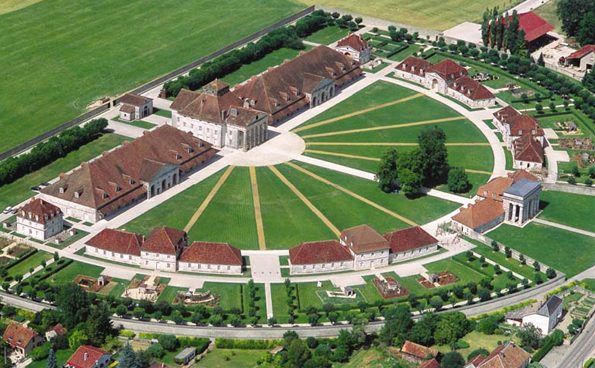 The real saline d’Arc Senans (Doubs) hosts for the seventh year in a row what is called “The Blue Night”, a night devoted to electroacoustic music. 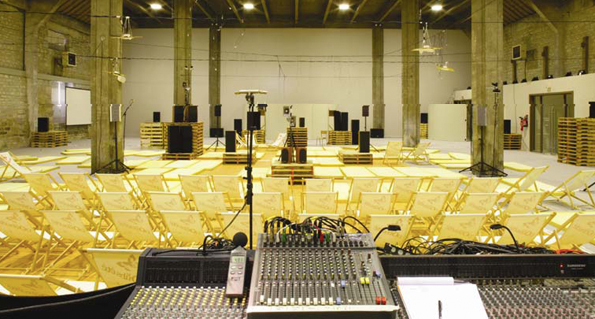 The acousmatic genre is present throughout the duration of a seven-hour long concert that takes place during the night. The term “acousmatic” makes reference to Greek philosopher Pitagoras who, in VI BC tought classes behind a curtain and in the dark so that his students would better concentrate in his words. Thanks to the “Acousmonium”, a set of multiple speakers through which the music travels creating a virtual space in which the audience is submerged. The listener, lying comfortably on a cushion or sitting on a rocking chair, is able to concentrate and listen to this “pure sound” while appreciating to the architechtureal masterpiece by Claude Nicolas Ledoux (1736-1806), which was declared World Heritage by the UNESCO in 1982. 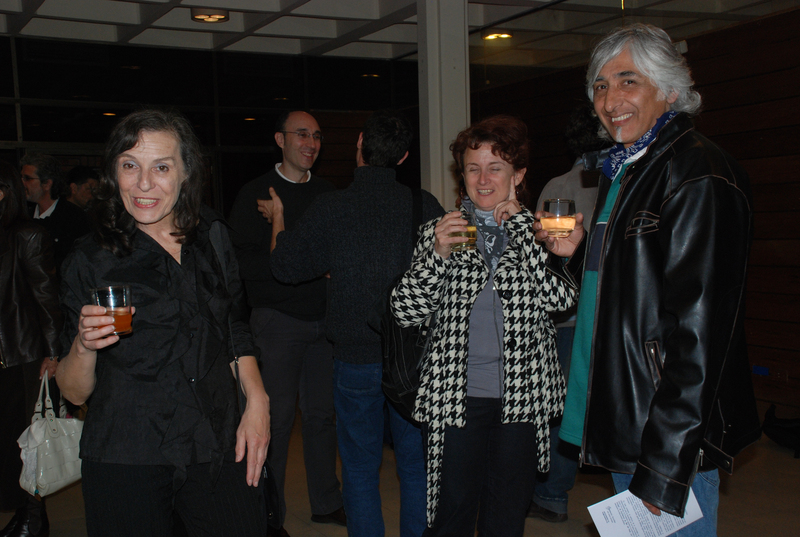 Acousmatic music is a music “from the inner self”, as defined by Elsa Justel, Argentine artist invited to the Blue Night. The 64 years old composer speaks with passion about an art she practiced since very young. She was 20 years old when she listened for the first time to Edgar Varese’s “Poeme electronique”. It was the year 1958 and it was like an epiphany. Ms Justel leaves her home town of Mar del Plata to go to Buenos Aires where she takes courses in Electroacoustic Music. This unlikely genre, was born in 1948 in the Television and Radio French studios of Pierre Schaeffer, the father of concrete music. He transformed the sounds removing them from their material features so that “during the experience things may talk about themselves as if they carried a message of a world unknown to us”, as Shaeffer wrote in 1952.
International Conference of Aesthetics "Peaks and edges of contemporary arts"
The Foundation Destellos has inaugurated its first event in Argentine with the International Congress on Esthetics: "Peaks and edges of contemporary arts" It has had the participation of important searchers in different areas, bringing a new approach to the contemporary esthetics by proposals oriented to the arts that use new Technologies. Musicologists, composers, performers, video artists, teachers; who introduce us in the different aspects that constitute the marrow of contemporary esthetics. They have aboard the Peaks and edges of today's esthetic thought. They transited by technologic, perceptive, musical, sensual short cuts to guide us in this research of beauty and esthetic enjoyment that is what makes us live. In this three days conference there were included themes as: "Music and technology", "Integrated arts", "Contemporary Esthetics", "Instrumental techniques/ Real time", "Creation by the Web", "Visual Music"; with the participation of : Mag. José Halac (University of Córdoba-Argentine), Dr. Bruno Bossis (Universities of Rennes and Paris Sorbona-France), Juan A.Lleó (Spain), Lic. Susana Espinosa (Univ. of Lanús), Dr. Emilio Mendoza (Univ. Simón Bolívar, Venezuela), Dra. Marta Flores (University of Comahue), Mag. Aitana Kasulin (IUNA), Martín Proscia (Univ. of Quilmes), Mariano Fernandez (IUNA), Fabian Luna (UNtref), Sandrine Baranski (Univ. of Lille3-France), Jorge Sad (Conservatorio provincial Alberto Ginastera), Martín Virgili (UTN MDP) and Dr Roc Laseca (University of Laguna-Tenerife-Spain). Session has been held in a pleasant dialogue with the participation of numerous public issue of different areas as fine arts, music, philosophy, theater, cultural management . Also there were artistic spectacles : "Rapsodia Adiós Nonino" of A. Piazzolla, by Cecilia Pugliese (piano), Guillermo Olguin (violin) and Luz Pugliese (dance); "Adiós" film of D.Galasse y R.Monforte and a "Concert of Visual Music Electroacoustic", with Works of Basilio del Boca, Gustavo García Novo, Chikashi Miyama, Gabriel Gendin, Juan Sorrentino, Diana Simpson and Elsa Justel. 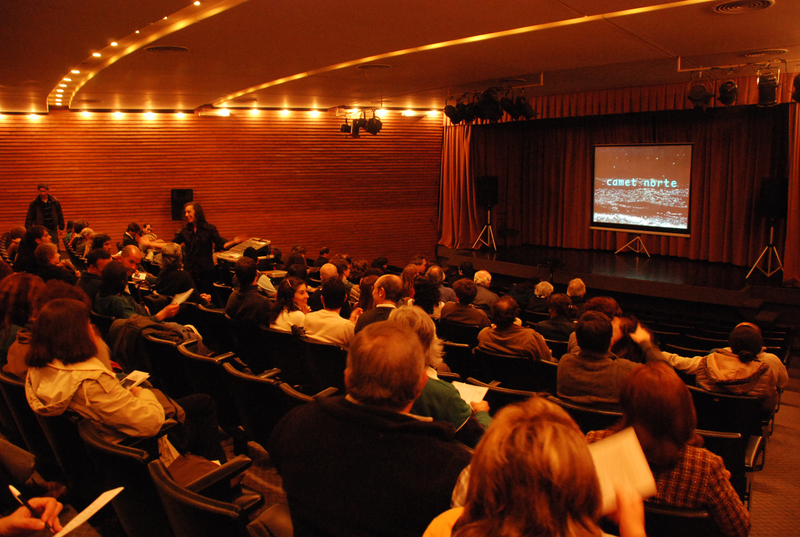 The event has been supported by Conicet, Universities of Mar del Plata and Lanús, CCEBA (Cultural Center of Spain in Buenos Aires), Notary collage of Mar del Plata, School of dramatic Art "Angelina Pagano" and the Cultural Secretary of Gral. Pueyrredón. So, we expect that this event will be fruitful to establish communication links between the different disciplines that participate in this congress. It is our purpose with this exchange of experiences to try to improve to a better understanding of the sense of Art and of its importance for the development of human knowledge. 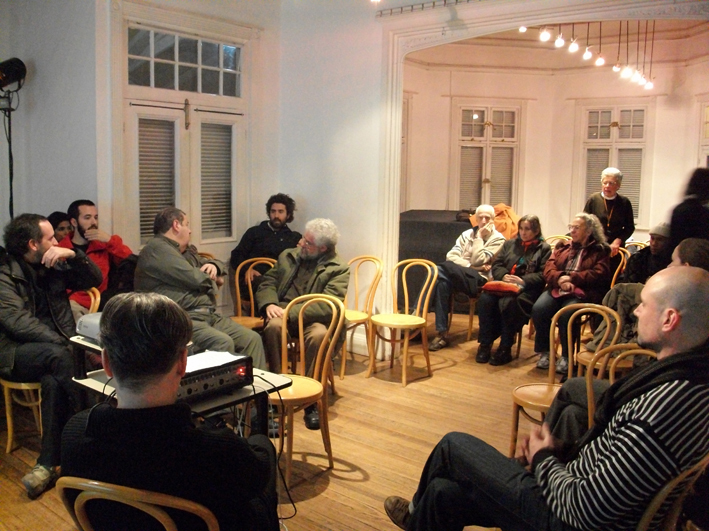 On july 2010 was organized the 1st Colloquium of Composers to discuss about the different aspects of Electroacoustic Music : spaces of sound diffusion, influence of multimedia expressions, management of creation, education, institutional exchanges and other topics related to the current situation of the composer. 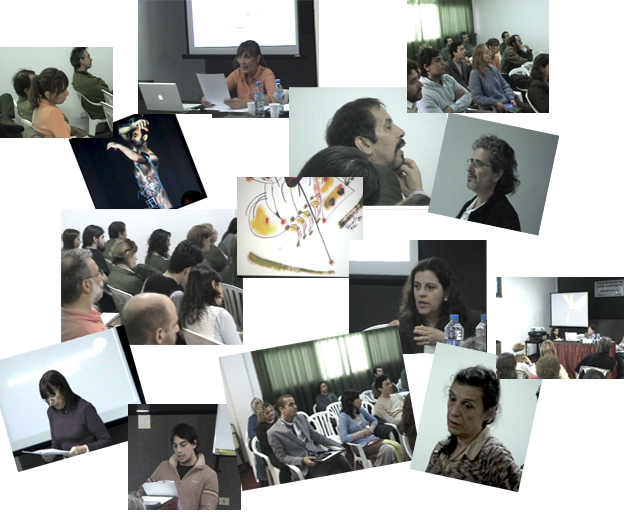 The meeting was attending by composers, students and teachers of Argentine and with the participation of the composers in residence Diana Simpson (England) and Chikashi Miyama (Japan). To close the Colloquium there was a concert in wich the participants presented their musical works.